We currently offer our members three types of sponsorship opportunities. Each sponsorship is designed to offer you and your organization unique benefits as a chapter benefactor. For more information, please contact our sponsorships chair at sponsorship@wfcache.org. If you would like to make a donation or if you already have a Sponsorship agreement with us, please, click the button below (a separate window will open and take you to PayPal). In the “Special Instructions” box, please enter the name of the organization, the amount you are donating, mailing address, and if it is a sponsorship, the sponsorship level (i.e. gold, etc.). We seek to accommodate the member organization’s preference and the chapter will reimburse the organization according to a mutually acceptable agreement. Member hosts receive all of the benefits of paid sponsors (listed below) for a given event. Help Fund Special Networking Events! Join WFC- ACHE as it salutes its members at one of the chapter’s two signature networking events: the Rays Networking event or the Annual State of the Chapter Event. Two of our largest events each year, these are great opportunities to meet and mingle with our members in a relaxed and festive setting. Other networking sponsorships are available and can be arranged by contacting our sponsorships chair, at sponsorship@wfcache.org. Gain visibility, establish vital relationships and position your products and services with decision-makers in the local healthcare industry. As a sponsor, you will extend your networking with leaders and align your company with the ACHE-WFC brand which is recognized as the premier healthcare organization for healthcare executives in Western Florida. Most of all, your sponsorship will help provide high quality, timely and affordable education to our chapter members. ALL RIGHTS RESERVED. 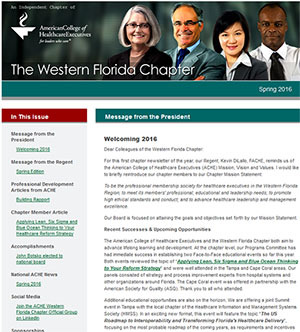 2011 WESTERN FLORIDA CHAPTER OF AMERICAN COLLEGE OF HEALTHCARE EXECUTIVES.